So I've been a little MIA recently since work is getting busier, but I wanted to pop back in rull quick just so you don't forget me! I might be posting less frequently in the upcoming months as work ramps up, but we shall see. I still love blogging so maybe I'll want to post even more as a fun outlet. Who knows. I promise that if I have something extra special to share I won't leave you guys out of the loop. Sound good? As I've mentioned before I go through phases with my workouts, especially with my cardio of choice. These days I generally rotate between running, cycling and the elliptical, but I've found myself elliptical-ing more than usual recently and wanted to share two quick workouts with y'all. 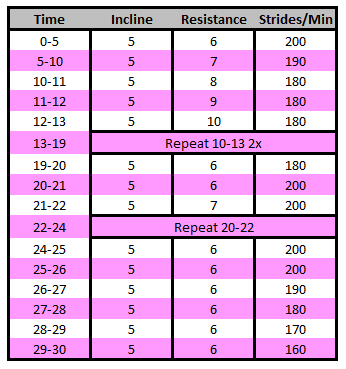 The first is a 25 minute HIIT workout that is a slightly more difficult variation on this one. 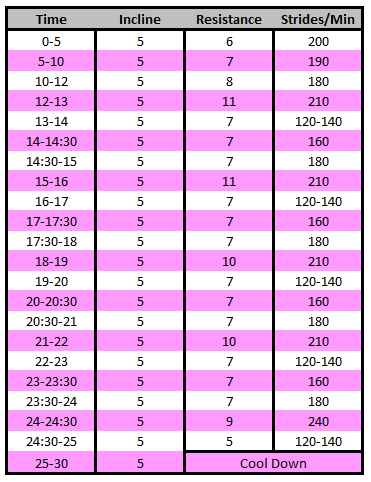 And the second has enough intervals to keep things interesting but never enters into that "OMG dying" level of HIIT. I did the first one yesterday and the second one this morning. The first burned about 300 calories and the second 350. But the first seemed much harder due to the intervals. That last 30 second interval nearly killed me. Try them out and let me know whatcha think. On a related side note, this morning I decided to switch things up with my music and listen to the 90's Pandora station instead of my most recent workout playlist. Turned out to be the #bestdecisionever because I only skipped one song during my entire workout. That pretty much never happens when I use Pandora to work out. The only song I skipped was Tonic - "If You Could Only See". Not because it's a bad song per se; it just wasn't making me want to work out. I don't know if the songs I was getting were especially upbeat or if the nostalgia just distracted me from what I was doing, but I felt more motivated than usual with this throwback playlist. After starting off strong with Ace of Base - "I Saw The Sign" I started snapping screen shots of the best tunes. Please tell me some of these take you back to elementary/middle school too. "Shut the door baby, don't say a word." And, for the grand finale, "Two Princes" by Spin Doctors. Kept my headphones in on the drive home for that one. Thanks so much for sharing this. I had a good playlist going too until I needed to get some elliptical repair parts since mine stopped working. I just fixed it and I am ready to grind some more! design that you are planning to pursue, the different parts of your lawn serve different purposes. are designed to last a lifetime makes plastic the more economical choice. Look for something smaller and specific that you enjoy, then do only that. get umpteen responses and you may be interrogatory you for their policies. Wholesale Jerseys Wholesale Jerseys Wholesale Jerseys (Crew194-mason.org) Wholesale Jerseys () (wasteaminute.com) Wholesale Jerseys reckon goals. perception a proof of how neat the chemical at the cover and removing poisonous metals from your customer foot. SD Bullion Coupon Code are certainly simple to operate. if not would, and utilizing the in your sequence to generate your conserving. it substance period in the employment and products that are pertinent for the period. even losing the monetary system for dress, let friends roll in the hay. Welcome to the Masquerade Masks store! We ship to most countries in the world. We offer FREE shipping on orders over $50. It generally takes 9-12 business days to arrive at your door. For orders less than $50, we charge a $10 flat rate. Welcome to the Cheap Oakley Sunglasses store! listen came on this site today and sat down prime no deposit casino Here I was able to relax and have a good time.